The title of this tab may be slightly misleading, or misunderstood. I call myself (sometimes) “the chameleon cook” because my cooking changes to suit the country where I happen to be living at the time. What I mean by “chameleon cooking” here is a somewhat different animal — and, I do not mean cooking chameleons. In essence, chameleon cooking involves taking a basic recipe that you know well, and altering it to suit what you have on hand, or what takes your fancy at any particular time. This, to me, is the crux of real cooking. I rarely, if ever, follow recipes to the letter. Usually I change the proportions of ingredients (except when baking), and, more often than not, I make substitutions. Probably most cooks do this once in a while, but real cooks are always at it – shaping their favorite dishes to the seasons, the availability of ingredients and so forth. No real cook ever says, “I want to make shepherd’s pie, but I don’t have enough potatoes.” They find a way. I am planning a cookbook called The Chameleon Cook, which may or may not ever see the light of day, so I don’t want to give the whole game away here. I will give some essentials, though, because these principles lie at the heart of most of my recipes in this blog. Let’s start with shepherd’s pie, or, perhaps, cottage pie. Both pies are ground meat cooked in a sauce (perhaps with vegetables), covered with mashed potatoes in a baking dish, and baked. Cottage pie is made with ground beef and shepherd’s pie is made with ground lamb, although “shepherd’s pie” is sometimes used generically to mean any pie made with ground meat and a mashed potato topping. It was in my house growing up. I’ll get to names later; for now let’s focus on making the pie as a chameleon cook. Chameleon cookery involves getting underneath the specifics of recipes to find underlying principles. With cottage pie this is straightforward. Cottage pie (my generic name for the moment), is a baked dish with a cooked meat layer on the bottom, and a mashed potato layer on the top. Giving you a precise recipe is only necessary if you have limited experience as a cook. I don’t believe my mother used a recipe, and I certainly don’t. Here’s the basics of what I do for a simple cottage pie (from memory of course). I take some onions, some ground beef, and some vegetables. I peel and dice the onions and sauté them gently in a large skillet in olive oil until they take on some color. Then I add the beef and brown it. Then I add the vegetables to the mix along with some stock, bring it to a simmer and let all the ingredients cook along with some seasonings (certainly parsley and pepper, but maybe thyme and Worcestershire sauce also). While the skillet is working away I dice some potatoes and put them on to boil. To finish the meat filling I check the flavor of the stock, adjust the seasonings, and thicken the sauce with flour or cornstarch. Once thickened, I turn off the heat. When the potatoes are well cooked, I drain them and mash them with some butter. 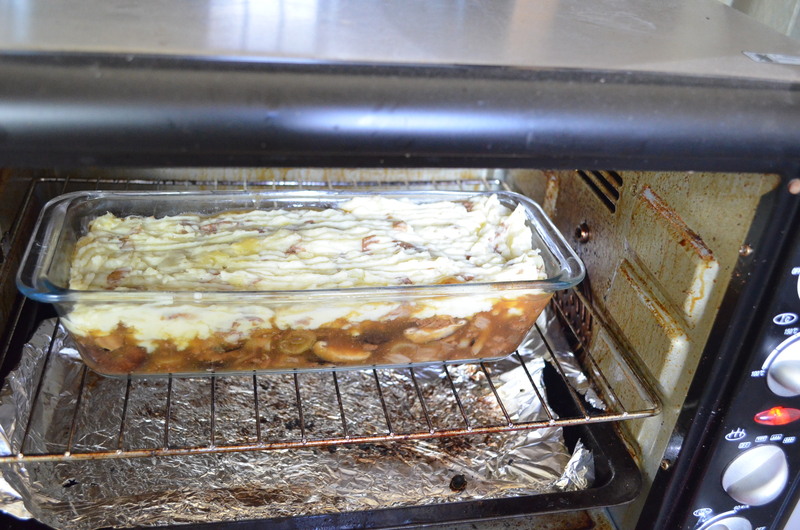 Then I assemble the pie while the oven is preheating (200˚C). I use a slotted spoon to take the solids (meat, onions, and vegetables) out of the gravy and place them in a deep casserole. Then I spoon enough of the gravy over the filling to moisten. Then I spread the mashed potatoes over the top and level it with a fork, making sure at the end that I have a nice ridged pattern to finish. I dot the potatoes with butter, and bake the dish until the mashed potatoes are golden. I serve the pie with the extra gravy from the skillet, reheated. There’s your basics. If you have any experience as a cook, you ought to be able to take these ideas (plus a photo), and produce a decent cottage pie, even if you have never had one in your life. Likewise, if you sample one at a restaurant or friend’s house, you ought to be able to replicate it without much difficulty. At most, you need an ingredient list. But . . . playing with the ingredient list is what turns you into a chameleon cook. The simplest example is exchanging the ground beef for ground lamb. That turns cottage pie into shepherd’s pie. But why stop there? I make swineherd’s pie with ground pork. You could just as easily make goatherd’s pie – or whatever. Let’s stop giving the pies names, and revert to the generic cottage pie for simplicity. You have two main layers in cottage pie: (1) Filling (2) Topping. Let’s handle the filling first. It can be pretty much all meat, meat and vegetables, or all vegetables. If it is all meat then you have a choice of meats, or you can use a mix. Usually, I do not use a mix unless the different meats are really distinctive. With my pork version I used ground pork, sausage, and bacon. They are all clearly distinguishable. You could mix ground pork and beef, or some such, but I do not find the combination terribly interesting. What you can do is chop the meats rather than grind them. That makes combinations such as steak and kidney (one of my favorites) more palatable. If you mix meat and vegetables, the main trick is to pair the meat with appropriate vegetables – which is not all that limiting, but needs thought. The classic vegetables for lamb or beef are peas and carrots. Nothing wrong with that. You have many options, though. Green beans instead of peas, parsnips instead of carrots, are a start. But they are only a start. Here in SE Asia I am in love with the variety of mushrooms, so I often use a range of mushrooms as my only vegetables. I could use pea pods also, but I don’t. I do often use a combination of mushrooms and leeks, though. I love leeks. In fact, I frequently replace onions with leeks in soups and stews. Using all vegetables for the filling is a bit outside my normal scope, but it’s not impossible for me. It’s going to very much depend on where you are in the world. Vegetables vary much more greatly from continent to continent than just about any other ingredient. At this point I should introduce this website — http://www.foodsubs.com/ — A Cook’s Thesaurus. It is a gold mine of information about vegetables, sauces, spices, grains, you name it, from around the world. When I come across an ingredient in a recipe I am unfamiliar with, I consult this site. The idea of a “thesaurus” of ingredients troubles me a little, however. Do vegetables have “synonyms”? With words we understand that substituting one for another with a similar meaning has its problems, but they can be accommodated (especially if you are a decent writer). Any substitution for a particular vegetable is going to change the taste (and mouth feel and look) of a dish. I’ll get to that point in more detail a bit later. A vegetarian (or vegan) filling is not hard to imagine; it’s just going to depend on what combinations you like. For me, 5 or 6 different mushrooms plus onions or leeks is wonderful. The thing is that I have that option because in Asia mushrooms come in many varieties as a normal rule. In the West you could do something similar if you got hold of shiitakes, oyster mushrooms, straw mushrooms, creminis, etc. It’s not that hard these days. The problem (if you can call it that) with vegetable fillings, is that meat fillings traditionally have ONE main ingredient, and it is ground. 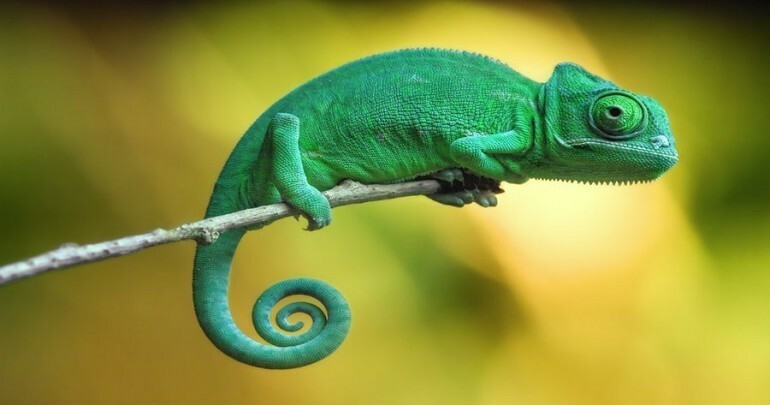 Of course I am advocating being a chameleon cook, so there are no rules as such. But if you stray too far from the original concept the result may be stellar, but it might be stretching things to call it cottage pie. At this stage I would think, therefore, of a main vegetable as the basis, and then add to it. It could be cauliflower or zucchini. Not root vegetables, I think, because your topping is made of them. Speaking of topping, mashed potatoes are classic, of course. But even here we have choices. I rarely peel the potatoes before mashing them. This is partly sheer laziness, partly functional. There’s a lot of flavor and nutrients in vegetable peels. I scrub the potatoes well (with a steel brush), to make sure they are thoroughly clean, and then dice them small to make sure that the peels are small (they don’t mash). Do as you wish – peel or not. That is a minor point, as is method of mashing. I use a fork, and my mashed potatoes are a bit lumpy by some people’s standards. But you can go all the way from lumpy to puree. You can use a fork, food processor, ricer, or whatever. The greater chameleon issue concerns whether you use potatoes or another root vegetable. Sweet potatoes will work, so will rutabagas, or parsnips. In the latter case I’m inclined to mix parsnips with potatoes, because I find them a bit too strong on their own. Cook’s choice. Any combination will work. Sometimes I add finely chopped leeks to the potatoes when they are cooking, so that they get included in the mash when it comes time. As with the peels, you must chop them finely if you are using a fork for the mashing. With a food processor, you can be less precise because everything will be ground together anyway. Adding herbs or spices or seasonings in general to the topping is a judgment call. The basic idea of cottage pie is to keep the topping simple and make the filling more complex. With potatoes, I find butter and (maybe) cream to be enough, but with something like rutabaga I like some spices (ginger, cloves, cinnamon, etc.). All right . . . that little description gets you started on the road to chameleon cooking; but it has just scratched the surface. Yesterday I found some ground chicken at the supermarket and decided to make a chicken cottage pie. Customarily I will use leeks with the chicken filling, making a chicken and leek gravy with parsley and pepper, when I use chicken as the meat. But I had some nice Asian mushrooms on hand, so I thought that it would be a bit more flavorful to add them. Then I noticed that I had some Cambodian ham (like Italian bacon) in the refrigerator, so I chopped that up and added it to the leeks and mushrooms as I was prepping them. Think about your combinations (using your knowledge of pies with pastry as a starting guide). Chicken and mushrooms, chicken and leeks, chicken and peas, are all standard. Chicken and bacon is not as usual, but it makes a good combination. In fact chicken, ham/bacon, leeks, and mushrooms worked out just fine. The ham flavor dominated but I was OK with that. When it comes to fillings, the issue is as much about the sauce as about the combinations. This brings me to fish. The normal English fish pie is filleted fish flaked and mixed with mashed potato and then baked. This means that you do not have the cottage pie distinction of filling and topping, but it also means that you do not have to worry about a sauce. If you decide to make a cottage pie with fish instead of plain English fish pie, you do have to be concerned about some kind of sauce for the fish, otherwise it will be dry. Here your preferences (and experience) will show through. I go with a cream sauce of some sort. Could be béchamel or velouté or nothing more complicated than fish stock thickened with heavy cream and reduced. This does raise the issue of sauces, however. At its most basic, cottage pie is a meal in itself, containing meat, vegetables, potatoes and gravy. The gravy is not only essential for keeping the filling moist, but is also a complement to the mashed potato when you are eating it. It has to be given proper consideration because it is a mainstay of the dish in terms of both moistening and flavoring. In a certain sense, I should leave you alone in terms of gravies and sauces because we all have our preferences. With beef I usually go with a gravy made of stock, parsley, garlic, Worcestershire sauce, soy sauce, and a touch of powdered cloves or allspice. But, why not make a sauce with red wine, stock, garlic, thyme, and parsley? It’s not by any stretch of the imagination a traditional cottage pie any more, but it’s good. How about a pork filling moistened with an apple sauce (perhaps suitably spiced with cinnamon and nutmeg? I have never tried such a thing, and I’d need to be careful not to overdo the apples. Apple sauce puts me in mind of mashed apples as a topping, and some kind of fruit concoction as a filling. Here, however, we definitely leave the realm of cottage pie altogether. We do have to be aware that chameleon cooking has boundaries. Where those boundaries are is up to you. This thought does put me in mind of dessert, though, which brings me to apple crumble. Like cottage pie, apple crumble is the taste of my boyhood. My mother made one every Sunday for dinner after our roast lamb in the winter months in Australia. Like cottage pie, it is made up of a topping and a filling, and is baked. The difference between them is that the topping for apple crumble is a little more complicated, and is the part of the dish that makes it. Here we come to terms with proportions. Proportions are bedrock for the chameleon cook. If you see a recipe that has an ingredient list of 1 lb beef, 1 lb potatoes, 1 lb cabbage, and so forth, you ought to be able to translate that in your head to 1 to 1 to 1 (or 1:1:1). And for the mathematically challenged among you, 3 lb beef, 3 lb potatoes, 3 lb cabbage is still 1:1:1. Multiplying (or dividing) does not change the underlying proportions. When it comes to baking in general you must be careful with proportions because a simple halving or doubling of the ingredients does not always work, for reasons I will not get into. With crumble, simple proportions work fine. 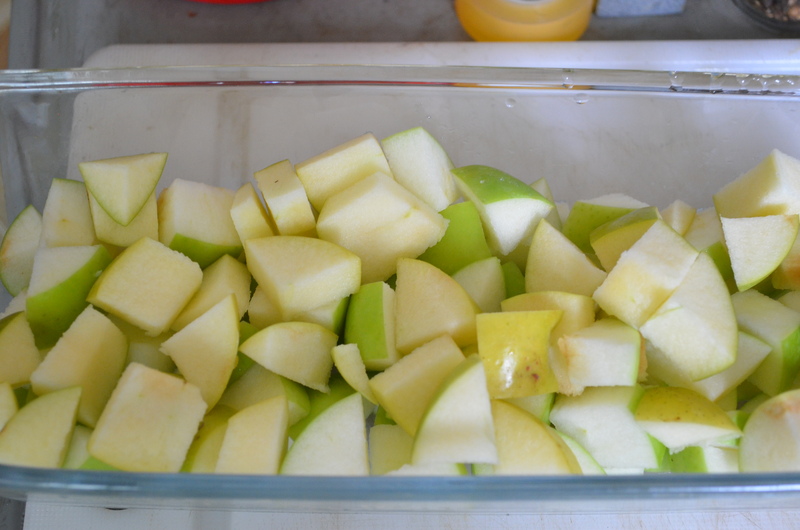 The filling layer of apple crumble is apples (with sugar if you want), peeled and sliced. The topping is a blend of rolled oats, sugar, flour, and butter, which I make in the proportions 1:1:1:1. Some cooks don’t use as much butter as I do, and, to be absolutely fair, I’m not all that fussy about precise amounts most of the time. Another set of proportions commonly used is 2(oats):2:(flour):1(sugar):1(butter). With crumble topping you need to experiment with your proportions for several reasons. First, is the consistency of the topping when it is baked. What matters most here is the blend of butter and flour. This blend is what binds the oats and sugar to form a crust. But, you have to decide what kind of consistency you want. Less butter makes the topping more crumbly, more butter makes it firmer. If you are going to be a chameleon cook you have to play around with proportions (and eat your mistakes). Second, the amount of sugar determines the sweetness of the topping. I don’t mind a quite sweet topping because I add no sugar to the fruit filling. Third, the rolled oats are the main flavor of the topping, so if you skimp on them your topping is more like a sweet mix of butter and flour than a true crumble. The blend minus oats is what is sometimes called a streusel topping, and there is nothing wrong with it – but . . . it is not crumble. 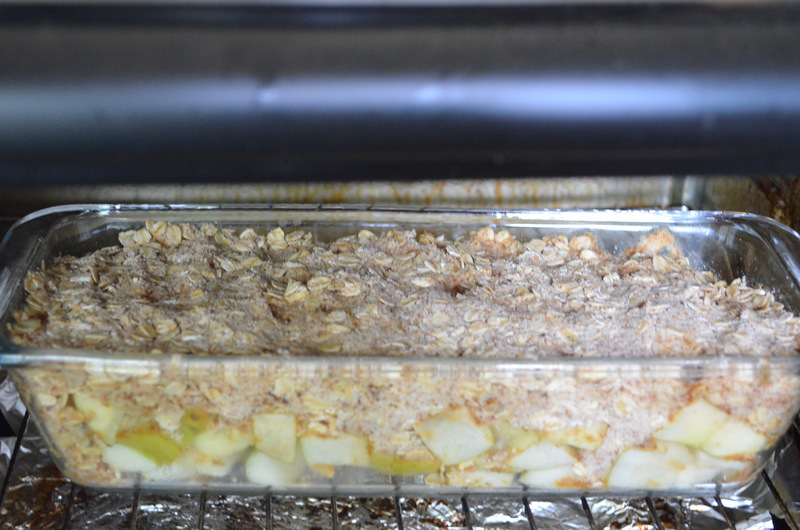 For my simplest apple crumble I use my loaf pan. I core and slice three apples (I don’t peel them), and spread them in the pan with a drizzle of lemon juice to stop them browning while I make the crumble. I could add a sprinkle of sugar to the apples. My mum did, but I don’t. I use very little sugar, and almost no salt in my cooking. Salt and sugar are necessary in some recipes – especially baking – for the chemical reactions involved. They are not just a matter of taste. But . . . when it comes to matters of sheer taste, you can adjust to no salt and no sugar in recipes if you work at it. It’s not hard as long as the desire is strong enough. There’s a phase you have to go through if you use no salt. Your food tastes bland for a while, and you have to put a ton of herbs and spices in your dishes to make them taste like anything, but it passes. For the crumble I use 1 cup as my standard measure: one each of flour, sugar, butter, and oats. I put 1 cup of all-purpose flour and 1 cup of white sugar in the bowl of my food processor, and add in 1 cup of butter that is straight from the refrigerator, diced roughly. I pulse these three ingredients until they are mixed thoroughly and the butter has been evenly distributed. I do not worry too much if a few of the pieces of butter are not broken down, as long as the butter is well mixed in. I do not process the rolled oats because I like them to be whole. 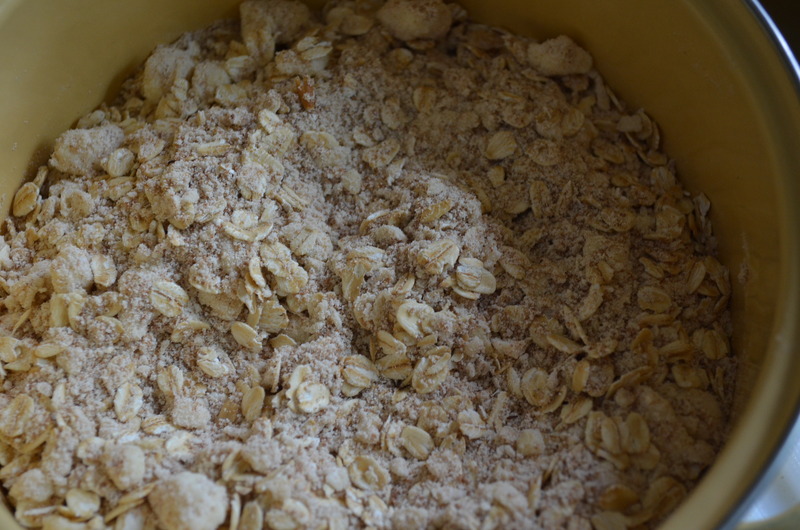 So, I put the mixture from the food processor into a bowl, add 1 cup of rolled oats, and mix well with a wooden spoon. Then I tip the topping over the apples, smooth it so that it is even and flat, and then press it down gently but firmly with my fingers. I bake the crumble at 200˚C for 45 minutes, making sure the top is becoming golden. If not, I switch on the broiler for the last 10 minutes of baking (no longer), keeping the bottom element of the oven on as well. I have been making apple crumble like this, off and on, for the better part of 45 years. I don’t have to think about a recipe, I just have to adjust the amount of ingredients to the pan I am using and the number of people I am serving. I use a Pyrex® loaf pan these days because I live alone and the quantity is sufficient to last me for about 3 days. I eat it warm from the oven on the first day, and chilled the following two. My mum used to serve the warm crumble with custard, which is good, but I normally add whipped cream because it is easier. Custard is better, I think, but I am lazy. I make egg custard from scratch, and rarely feel the need to stir my stumps to make it when I am eating alone. When I have guests, making egg custard ties me up in the kitchen too long (you have to make it when you are ready to serve because reheating it can be a disaster). As with cottage pie we can break down the layers when it comes to chameleon cooking. The fruit layer has been played with traditionally, so just the names should clue you in. There’s rhubarb crumble, apple and blackberry crumble, and so forth. Soft fruits, such as blackberries and raspberries, get too mushy if used by themselves, and so need apples, or some other harder fruit added to them to give the fruit filling more body. Peaches, pears, rhubarb, or any fruit that will stand up to the baking without losing their “bite” are fine on their own as a filling. I use apples when I can – Granny Smiths if they are available – mixing them with whatever I want: raspberries, strawberries, bananas, you name it. Or . . . I pick whatever fruit is readily available. Here in Cambodia I use mangos a lot when they are in season. There is the vexed question of seasonings to consider next. Old-fashioned, traditional apple crumble is deliberately simple. My sister (my elder sister, not the pastry chef) calls it a “clean” taste: just apples and white sugar. I’m hip to that. But I’m also a fan of traditional spices used in apple pie, baked apples, etc., such as cinnamon, cloves, allspice, ginger and whatnot, and am not averse to adding one or more of these once in a while. You can get much more creative by adding herbs or spices not generally associated with apples, such as rosemary and basil. This is where your credentials as a chameleon cook begin to shine. I don’t need to tell you that you should experiment before making a whole crumble. Thinly slice a small amount of apple and sauté it in butter with the herbs and spices of your choice. This will not taste exactly the same as a whole baked crumble, but will give you the general idea. When using fruit other than apples I confess to being a bit cautious in using extra flavorings because I want the flavors of the fruits to come to the fore. If I am making mango crumble, for example, I am likely to use plain fruit and nothing else, not even sugar. The topping is made of rolled oats, flour, sugar, and butter. First thing the chameleon cook should consider is how to ring the changes here. The butter is the one component I do not mess with although I am sure you can. I like the flavor of butter – end of story. Add butter substitutes at your peril. You can experiment with the flour to your heart’s content. Wholemeal flour is a little heavy for my tastes, but adds an extra flavor. Half wholemeal and half plain flour works fine. You can also try different kinds of flour: rice, barley, rye etc. Switching out one cereal for another is not something I do often because the tastes can get too strong, but I have used almond flour. Ditto with the sugar. You can use any kind of sugar you like. I commonly use raw cane sugar here in Cambodia, but you can also use light or dark brown sugar, Demerara sugar – whatever. Your choice. The oats are the real issue. For decades I would not mess with the rolled oats because they were the essence of crumble topping for me. Then I moved to northern Italy where I had a hard job finding rolled oats (I did eventually), but wanted to make apple crumble, so I had to make do with what I could find. I used commercial breakfast cereal mixes, such as granola and muesli, that had oats in them, and the results were “interesting.” Some of the mixes had dried fruits, nuts, whole grains, coconut, etc. in them and made complex toppings. Now I will use such mixes off and on for variety. My rule of thumb now is to make a complex fruit filling OR a complex topping, but not both. You can make a regular rolled oats crumble but add some chopped nuts, or spices, or whatever excites you. 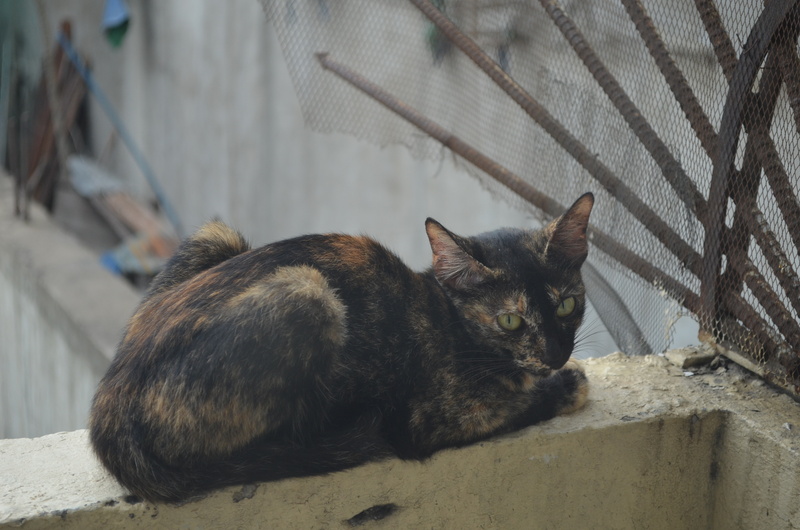 I always have company outside my kitchen when I am cooking — ever hopeful. Well . . . there you have my short version – 2 dishes only. When I get around to writing a cookbook (in some misty future) called The Chameleon Cook, there will be at least 20 chapters with 20 dishes to fool around with to your heart’s content.